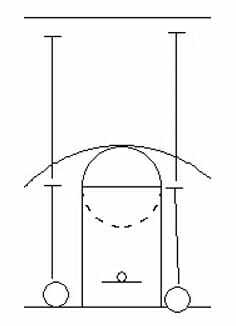 Helps players perfect proper rebounding footwork. 2. First player in each line gets into Triple Threat Position. 4. Players take a quick first step with their right foot and then start jogging to half court. 5. At free throw line extended, player executes a Quick Stop and then jumps up for an imaginary rebound. Player should go up with two hands and jump off two feet. 6. Player lands, chins the imaginary ball (brings hands in tight against chin), then executes a Quick Start and jogs to halfcourt. 7. At halfcourt, player jumps for another rebound. Rebounds should be two-handed and two-footed – go up with two hands in the air and jump off both feet.